It’s born for the oily type skin? Oily type skin suffers from the oil itself and the dull color of the skin. So when they purchase a keratin caring product, they tend to forget after using a month. It’s really painstaking to take care of the keratins all the time. This product is about sleeping recover night treatment. During the nighttime this special night care serum helps the skin to recover. There are two effects of taking care of the keratins and recovering. It removes the dead cells and takes away the dullness helping the cells to recover. It’s different from other products that have grains or melting substance. The word recover was just same as other renewal cosmetics. However I feel that my skin gets softer because it cares the keratins. So some people use renewal serum as like skin or lotion that takes care of the keratins. So people who are in worry to buy some product for their keratins try it out. During the application it removes the dead wasted skin cell on the face making your face brighter. If the skin doesn't have enough moisture it tends to become tired and old. So after applying the renewal serum on the next morning pay attention to the moisturizer. After that don’t forget to wear a sunblock. Renewal serum helps the skin to remove the dead skin in mild way so the difference with other pilling item is that you could use every day for people who needs to. So check you skin type before applying how many times a week. Also if you want to have more effect applies some collagen after applying the renewal serum. It helps the tenacity of the skin and tightens the pores and controls the amount of oil releasing. When the serum is completely absorbed use a sleeping peck so it increases the effect. Every skin can recover during the sleeping time. During 10pm ~2am it’s the best hours for the skin to recover. It helps the damaged skin from the sun and polluted air to be recovering again. However when the person use high functional cosmetics that is too much for their skin might destroy the rhythm of skin recovery so have to be careful in choosing right basic skin care. The piling products are expensive but don’t buy inexpensive item because it might not work properly. So choose a piling product carefully looking at the information and thinking over if it goes well with my skin type. Someone told me that my forehead got brighter. In my face, my forehead is the darkest. And I think this product helped me and from then on I use it constantly. This R.N.D. 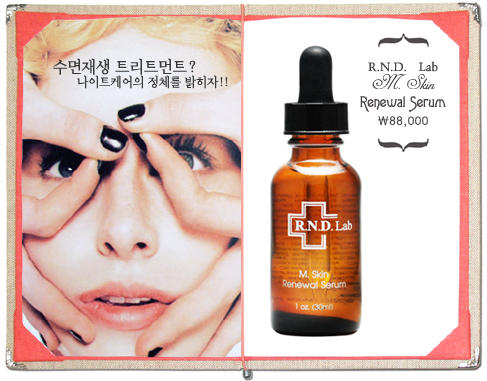 Lab renewal serum helps the rough skin to become soft. Also it helps other skin care products to absorb well like skin care booster. Compare to the price the size is only 30ml. However you don't have to use it everyday and not a lot of amount. For normal skin type use for 2~3 times a week. I used 3 times per week after I clean my skin with the toner. The entrance is a droplet type so can place on the area right away. 3 drops would be fine to cover all the face. But the most important thing I don't like is the smell! It is similar to SK2 essence, which I don't really like. So I am just reminding you on the smell. There is some important information you need to know about renewal serum! The products that contain AHA or BHA or using other pilling item together, it might stimulate the face so have to look out for that. Also during the application it might stingy because the long dead cells are falling apart. So instead of using 3 times a week, lessen it down to 2 times a week.